Using a processor to knead helps but you can do this by hand as I did. Now add the butter pieces one at a time and process till there no large chunks of butter are left in the bottom of the bowl. Now add a little more flour until your have a soft, pliable and elastic dough that is most but not overly sticky. Turn the dough out onto a floured surface and knead gently until the dough no longer sticks to your hands. Shape the dough into a ball and place in a lightly greased large mixing bowl., turning it to coat well. Cover with a damp towel and let it rise till double in volume. This should take about an hour. Punch down the dough and roll out to a thickness of 1/2" thickness. 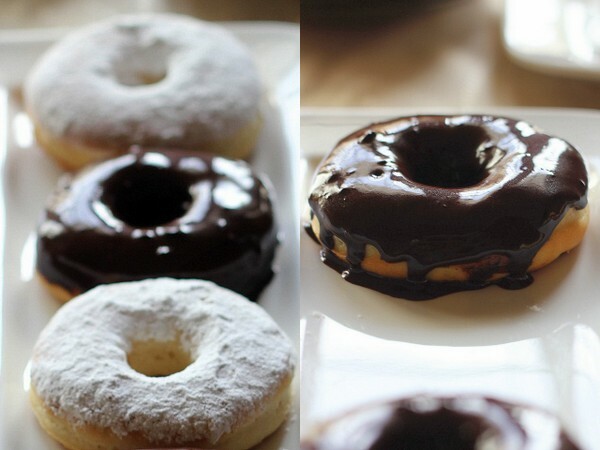 Cut out doughnuts using a doughnut cutter or whatever you have on hand to cut out 3” diameter with 1” diameter holes ( I don't have a cutter. So I used the rim of a wide juice glass and a syrup measurer for the inner circle.) Press steady and firm till you feel it has cut through the dough and touches the hard working counter. Pressing firm enough to the working surface, wobble a little and lift your cutter (glass in my case). The donuts would have cut out clean. Do not twist the cutter or else you will end up with multi circles as you see in the middle one above. Such ones will be disfigured after the rise. After cutting the donuts, pull away gently to gather the scraps, I removed the middle one along the scraps as you see in the picture. Re-roll the scraps and cut out more doughnuts. The very last left over scraps of dough can be rolled them into marble sized balls and baked. Don't forget to roll them in powdered sugar after baking :). If you’re making doughnuts to fill with jam, do not cut out the holes. 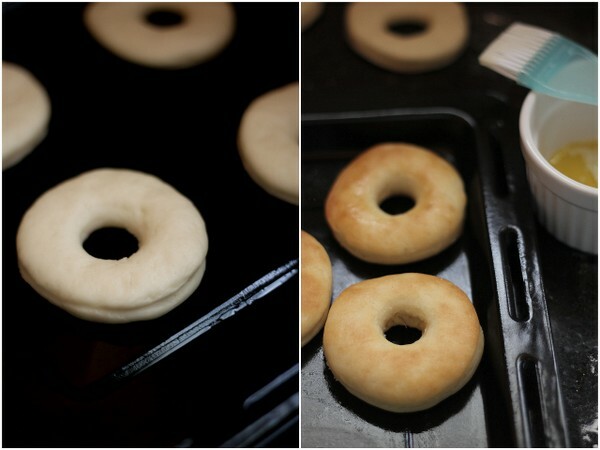 Place the doughnuts and the holes on parchment lined or lightly greased baking sheets, leaving at least 1” space between them.Let them rise for about 20 minutes or till almost double in size and then bake them at 200C (400F) for about 5 to 10 minutes till they’re done and golden brown. Do not over bake them. 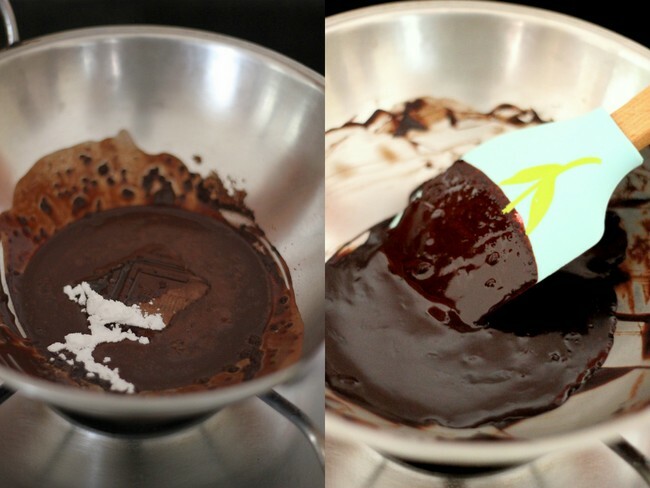 Combine 2 tbsps unsweetened cocoa powder + 2 tbsps powdered sugar + 3 tbsps of water + 1 square of cooking chocolate. Melt in slow flame until saucy and coats the spoon/spatula. Drizzle hot water if required or the sauce is too thick. Check sugar. 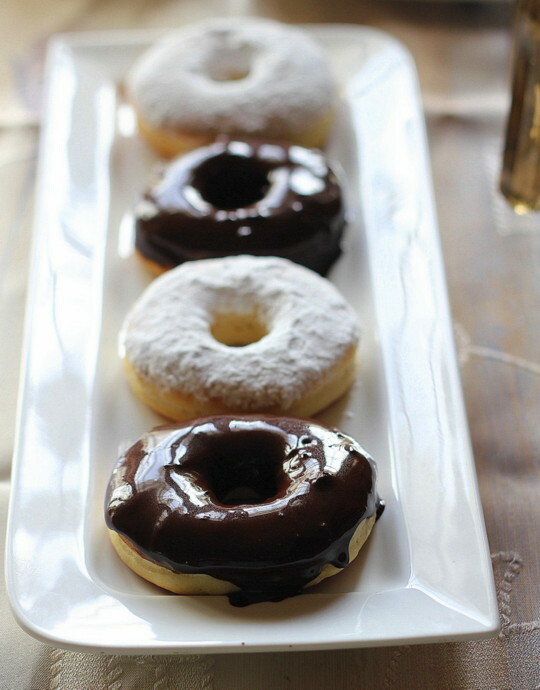 Dip the tops of donuts while the chocolate sauce is still warm. Invert and keep aside to set. I halved the recipe which yielded 12 small baked donuts for 4 of us. 6 of them were dipped into sugar cinnamon mixture and the rest into the chocolate sauce. You don't have to worry about the std size of the donuts. They can be of any size but be careful while you cut/shape them out. i loved the chocolate glaze amazing ! yumm and perfect to have with a cup of coffee. I can't believe it's baked...looks perfect! Dripping chocolate glaze and cinnamon sugar dusting makes it more attractive. Looks fantastic! 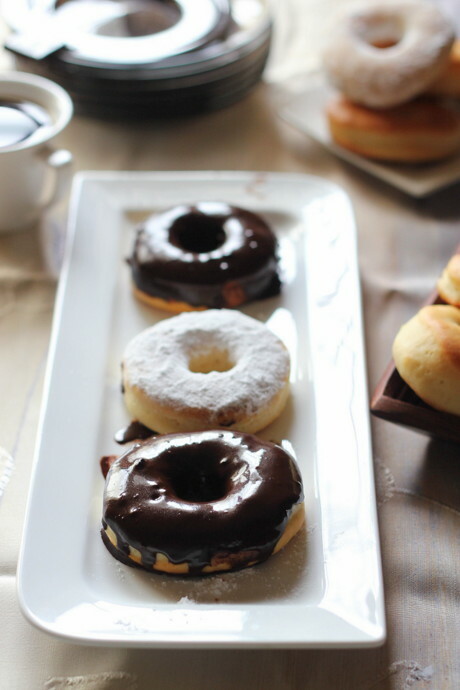 I find the water roux method works wonders for these baked donuts and makes them sort of melt in your mouth :) They give the fried ones a "run for their money" so to speak. Looks so scrumptious. I cannot control my hunger after looking at these pictures. 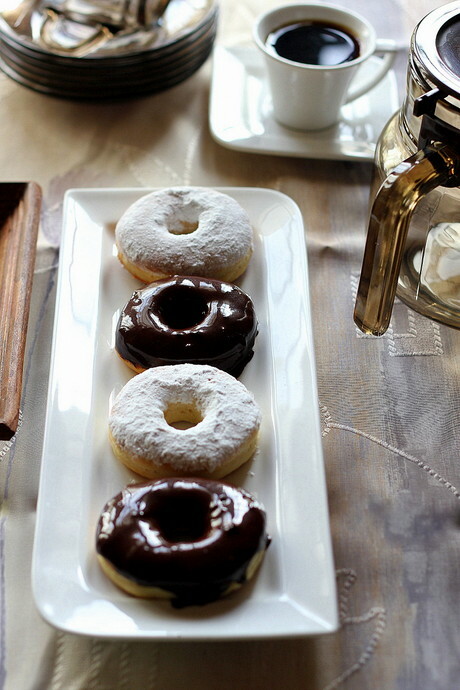 Fantastic and cuties, beautiful donuts..love to munch some. Woww... they look absolutely perfect.. awesome !! I love baked food especially cooked at home. I remember on my Mumbai visit I have taste many baked items but Mumbai special cake is the best.